In September 2013, the Foothill Symphonic Winds and the Bay Area music scene lost a great friend, musician, and mentor. Nicholas "Nick" Stumbaugh died unexpectedly from complications after a car accident. Nick had been playing clarinet and saxophone for over 50 years and was a 10-year member of the Foothill Symphonic Winds. He was active in many other local musical groups including the Woodside Village Band, the Serenaders dance band, the Cal State East Bay concert band, and the Ohlone Clarinet Choir. He also played in many community musical theater productions and with local symphony orchestras. He worked as a criminalist in the San Mateo County Sheriff's Forensic Laboratory. His friends and family wanted to establish a memorial that would honor his love of music and inspiring others, particularly young musicians, in a significant way. 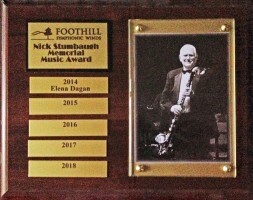 With help from Nick's family and friends, the Foothill Symphonic Winds established the Nick Stumbaugh Memorial Music Award. This award has been given annually to an outstanding 7th grade music student at the Blach Intermediate School, where FSW rehearses. The award provides funding for music instruction. A plaque has been presented to the recipient at Blach's Spring Music Concert. A larger plaque is mounted in the Rehearsal Room noting each year's winner(s). In January 2019, the Foothill Symphonic Winds completed the Award effort with the donation of a 36-in Yamaha concert bass drum to Blach's music program. 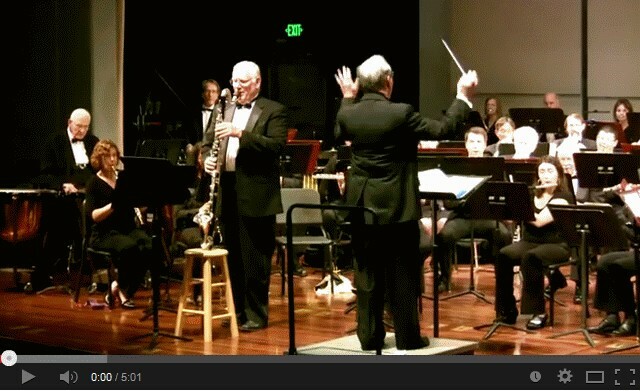 During the FSW's December 2012 concert, Nick played the bass clarinet solo in David Bennett's Basswood. We are fortunate to have a recording of that performance. To watch that video, please click on the image below or this YouTube link.